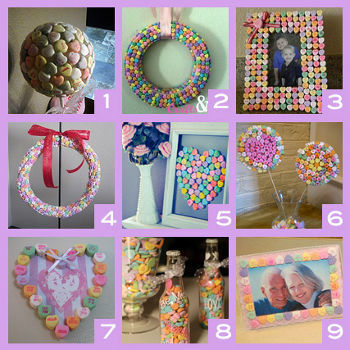 Valentineâ€™s Day is still a good month away, but that does not mean Valentineâ€™s Day candy is in any short supply. Youâ€™ve probably noticed that your local supermarkets and drugstores redesign their candy aisles the day after Christmas (seriously, it was snowmen and Santas one day and hearts the next). A staple of the holiday is the famous (infamous to some) conversation heart created by Necco. 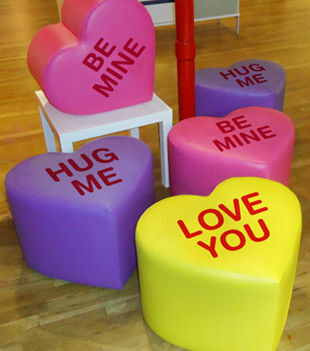 These are those tiny Necco wafers shaped into hearts with small phrases written on each piece. As they do every year, Necco has changed up the phrases. This yearâ€™s collection is culinary-themed. 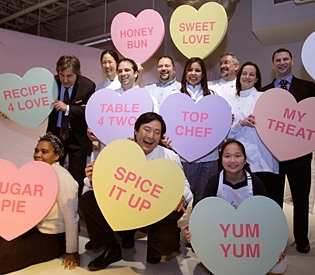 They include: â€œRecipe 4 Love, Table 4 Two, Stir My Heart, Top Chef, Sugar Pie, My Treat, Yum Yum, Honey Bun and Spice It Up.â€ My personal favorite of the bunch is Top Chef, but I suppose classics like â€œI luv Uâ€ never die out. 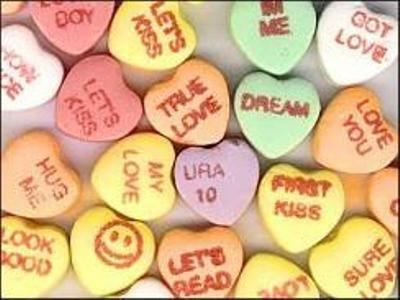 By now all our European and other non-US readers are wondering what the big hullabaloo is about conversation hearts. If you didn’t grow up in the US getting at least one Valentine with one of them stuck to a tear-out Mickey Mouse card every year, well, you would understandably be a bit lost. Lucky for all of you, I discovered a pretty good European equivalent! An Inconvenient Truth: Conversation Hearts Go Enviro! People seem to have a love/hate relationship with Sweethearts. Everyone buys them for the novelty value, the tradition, and the entertainment they provide… but you may be hard pressed to find someone who actually enjoys eating them (except for our own Caitlin, of course, who actually likes conversation hearts). While not one of my absolute favorites, this year’s weather and environment based sayings make me love them just a bit more. Who hasn’t been “In A Fog” about a loved one, or wanted to say “Chill Out” to a former boyfriend? In addition to the weather phrases Necco has added some environmentally friendly ones, including my personal favorite, “Do Good.” Obviously “commit random acts of kindness” was just too long to fit on a conversation heart. I suppose it’s true that love, much like the weather, is a bit unpredictable – hence why these new hearts are the perfect sweet present for your very own El Nino/Nina.